It isn’t a simple matter to find a viola da gamba for sale or a violin maker who crafts them. They are rare and fascinating. The stringed instrument family is a matter of arms and legs, and horizontal and vertical – all as described by the Italians in mellifluous terms. The instrument popularly known as the violin is short for “viola da braccio,” which indicates the instrument is played on the arm (“braccio”) in a horizontal position. This is as opposed to the “viola da gamba,” or the instrument played vertically, between the legs (“gamba”). All viola da gamba are bowed with an underhand position and are collectively referred to as “viols”. Generally larger than those arm-played violins – hence, the floor-rest position – the viola da gamba are actually a range of instruments of seven sizes: the rare predessus de viole, treble, alto, tenor, bass, and two contrabass versions (the great bass and the violone in D, tuned an octave lower than the great bass). Not included in this list is the cello. This is because the number of strings on viola da gamba has six, sometimes seven, strings where the cello has only four. Tuned in fourths, the members of the viols family can be played with chords. The sound is considered quieter than more modern stringed instruments, and with the exception of the bass, too quiet in large orchestras where fine violins, violas and cellos will simply overpower the gamba. It’s more common to see a viola da gamba played in quartets and quintets – where the timbre of the instrument is prized in Renaissance and Baroque music. Some of the signature compositions for viola de gamba came from the likes of J.S. Bach, Henry Purcell, William Byrd, Marin Marais and Francois Couperin. But the instrument family was notably part of 16th and 17th century amateur performances in affluent circles. The “mixed and broken consorts” (ensembles) included a bass viol, lute, cittern, treble viol, harpsichord or spinet, and vocals. Dutch paintings (Vermeer, Verkolje, et al.) frequently included a resting or played bass viola da gamba to reflect on domestic life and to convey social status of the subjects. But contemporary composers haven’t forgotten the viola de gamba. 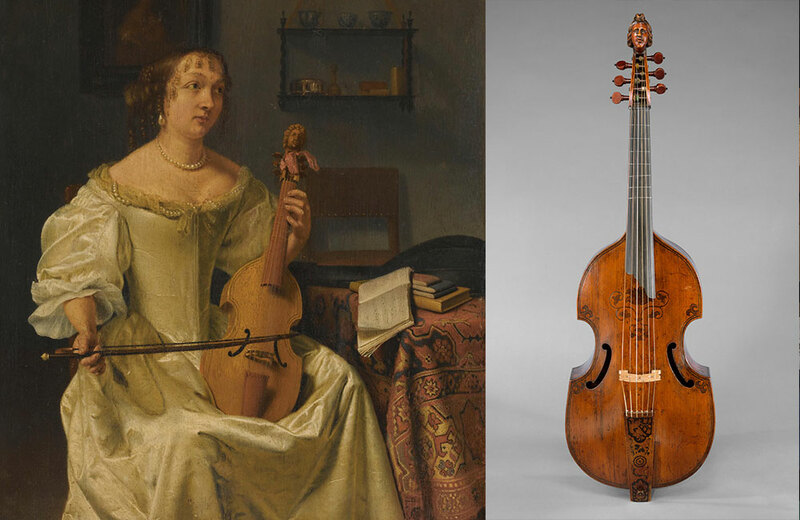 Viola da Gamba societies in Great Britain and America, embraced by enthusiasts for early and contemporary music, encourage study of the family of viols. This is possible because these instruments are both more affordable (some are manufactured with automated techniques, others hand crafted) and accessible to adult students. The Viola da Gamba Society of America – made up of players, violinmakers, publishers, distributors, restorers and fans – maintains 18 local chapters in far-flung regions, from the Appalachia South to New York City to Southern California. Interestingly, it was incorporated in 1962 by a small group of players in rural Maryland. The VDGSA sponsors an annual conclave around the U.S., but also has a robust website that includes free downloadable sheet music (example: Bach arrangements from the Yukimi Kambe Viol Consort), a microfilm catalog, and a program to stimulate development of new music for the viola de gamba.